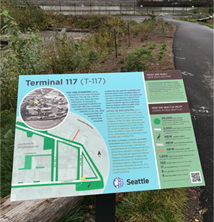 In August 2016, the City of Seattle completed the “Adjacent Streets & Stormwater” phase of Terminal 117 Early Action Area within the Lower Duwamish Waterway Superfund site. Thank you to the South Park neighborhood for all your support throughout this cleanup and construction project! Completed construction photo gallery by zone now available. The City of Seattle and Port of Seattle have removed all contaminated soil from Terminal 117! Read more about the details for each phase of the cleanup project throughout this website. The Terminal 117 cleanup site (T-117), located on the west bank of the Lower Duwamish Waterway in South Park, is a joint cleanup project by the Port of Seattle and City of Seattle. This site was identified for cleanup because the upland property, river bank and sediments, and parts of the adjacent yards and streets have high concentrations of PCBs (polychlorinated biphenyls), dioxin/furans and other contaminants. T-117 is designated as an Early Action Area (EAA) as part of the Lower Duwamish Waterway Superfund Site listed by the U.S. Environmental Protection Agency (EPA) under the Comprehensive Environmental Response, Compensation and Liability Act (CERCLA). In fall of 2010, EPA issued the final removal Action Memorandum for the T-117 site based on the findings in the project's cleanup plan (EE/CA). The Action Memorandum identifies a plan to remove upland soil and river sediment to reduce PCBs and other contaminants to levels that will protect the river environment and reduce health risks to people. Cleanup is now complete at the T-117 site! The Port of Seattle finished cleanup of the uplands and in-water sediment in 2015, (read more on the “Uplands/Sediments” tab on this website). The T-117 Removal Action Completion Report - Phase 1: Sediment and Upland Cleanup was completed in June 2018. The EPA approved the Completion Report on July 3, 2018. The City of Seattle finished cleaning residential yards in 2013 and completed cleanup of the adjacent streets and construction of new stormwater infrastructure in October 2016, (read more on the “Streets/Yards” tab). Long-term monitoring, maintenance and sampling will be performed in accordance with the EPA approved (July 3, 2018) Joint Long-Term Monitoring and Maintenance Plan (LTMMP).